A startling twist in treatment as we arrive in London to pursue Amanda's cancer treatment. After Amanda's ovarian cancer came back less than six months after treatment, she was accepted into a Phase 3 clinical trial for a new drug being tested in combination with another drug called Caelyx, aka PLD, aka pegylated liposomal doxorubicin. The new drug, code named EC145, targeted folate-sensitive ovarian cancer tumours. 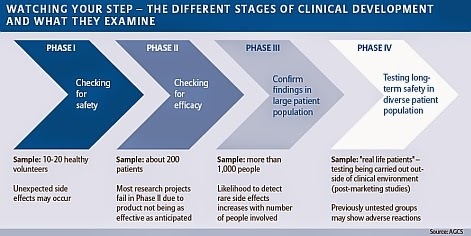 A Phase 3 trial happens after the drug company has already figured out how the drug works, whether it's safe, whether it works, and before it goes to sale. It's the last stage before they roll it out and say "Folks, this is ready for prime time. We've done it." Well, this drug, vintafolide, apparently wasn't ready for prime time. Merck, the company running the PROCEED trial, announced that its regularly scheduled review of data found that "the data suggested that vintafolide was unable to improve progression-free survival (PFS) in patients with platinum-resistant ovarian cancer." In other words, it wasn't working after all. Merck has stopped the trial. In doing so, it's also un-blinding the patients and doctors. We didn't know until now whether Amanda was getting the test drug in combination with Caelyx, or whether she was getting the placebo. Guess what? She was getting the placebo. The good news, if we can find any, is that she won't have to travel to Toronto from London three times a week every second week to get...well...a nothing injection. The bad news, and it's kind of obvious, is that the trial that was providing her hope is ending. The worse news, and I hate to bury the lead, is that the latest CT scan done in Halifax shows her tumours have grown. They haven't grown a whole lot, but they've not stopped growing. One of her kidneys is also looking weird. It's something called hydronephrosis and I don't know much about it. Well, Caelyx has been virtually impossible to get. Problems with the manufacturer made it effectively unavailable for a long time. Years. We're told that those problems have been fixed and Caelyx is now available if the doctors decide it's what you need. Merck is also continuing monitoring the trial. People who were on Caelyx as part of the trial are invited to continue getting Caelyx and continue being checked. So, for now, Amanda's going to keep getting Caelyx as long as it doesn't show signs of not working. I would have said "as long as it continues to work" but so far it hasn't really shown that it's working. She's been told Caelyx takes some time to start doing its thing. We're hoping that it starts working before the tumours grow enough to put her off the Caelyx, because we really don't know what the next option would be. For now, the treatment continues. Amanda's in the chemo chair at Princess Margaret Hospital right now as I write this. She'll go every 28 days for a shot. The side effects have been different than what she had during last year's first treatment with carboplatin and paclitaxel. This time she's been having rashes. Nasty, weeping, blistering rashes. It's also messing with her blood counts. All in all, life is still very intense. We're going through an incredible amount of change in an unfamiliar environment, under heavy time lines, and under a life-and-death arch. As usual, I'm amazed at how well we're all doing considering what we're going through. thiết kế Website quán cafesẽ là một phương tiện truyền thông tốt nhất để Bạn có thể thực hiện ý tưởng của mình trong việc quảng bá web thiet ke website giai triChi phí để thiết kế website chuyên nghiệp thật là quá nhỏ bé so với những núi chi phí mà bạn bỏ ra để quảng bá. thiet ke website nha hang tiec cuoiVới hàng ngàn người lượt truy cập Internet thường xuyên, công ty, doanh nghiệp bạn sẽ nhanh chóng được biết đến. thiet ke website ban v may ban onlinecông ty hoặc tổ chức của bạn trên website vào bất cứ lúc nào và từ bất cứ nơi đâu, chỉ với một chiếc máy tính kết nối vào internet.